The Cameron School of Business named recent graduate Scott Thomson as the winner of the eighth annual business plan competition, the University of North Carolina Wilmington announced today. The competition allows students to gain practical experience beyond the classroom by doing a comprehensive business analysis as a culminating experience for their major in entrepreneurship and business development. Twenty-six seniors in the Entrepreneurship and Business Development program submitted and presented comprehensive business plans. Three students were invited to present their plans in the business plan competition. Tori Keaton and Jim Kittridge were the other student finalists who presented their plans. Thomson, a Charlotte native said, "The business plan competition gives students the opportunity to apply market research, financial projections, strategy development and other business concepts used in the comprehensive business plan to the real world. Getting feedback from the successful entrepreneurs who serve as the judges is beneficial. I plan on using all of these resources to turn my business concept into a reality." The competition is one of the many ways the Cameron School of Business provides students with the skills and knowledge to think critically and act responsibly in meeting global business challenges. Previous finalists have started their own ventures, some are working in business development in emerging ventures such as nCino. One past winner is working in a business incubator in New Zealand. 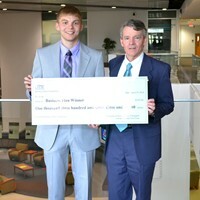 "Students are asked to do extensive research and take their work to the next level by developing plans that can be operationalized," said Stephen Harper, UNCW Progress Energy/Betty Cameron Distinguished Professor of Entrepreneurship, and competition coordinator (pictured with Thomson). "This is a unique opportunity that showcases our students' mental dexterity to veteran entrepreneurs within our community." Thomson received a monetary prize as well as accounting, legal, marketing and management advice services from select sponsors. Castle Branch was the Master Sponsor. Other sponsors included McGladrey LLP, Ward & Smith, SpecialtySoft, South-Tek Systems, BluZeus Interactive Marketing, The Beck Foundation and South Coast Investments. Jeannette King, of SpecialtySoft, Clayton Gsell of South Coast Investments and Justin Queen of Blu Zeus Interactive Marketing served as judges in the competition.